Trigeminal Neuralgia (TN) is a facial pain syndrome. It is typically characterised by short term, unilateral facial pain following the sensory distribution of cranial nerve V, the Trigeminal Nerve. Most commonly the pain radiates to the mandibular or maxillary regions. In some cases, it is accompanied by a brief facial spasm or tic. 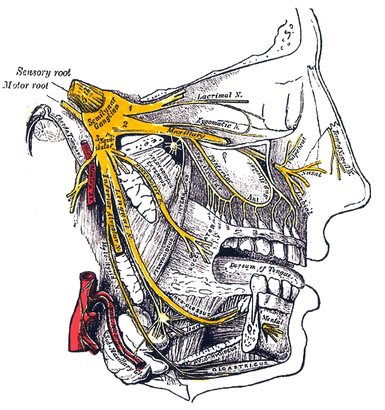 The Trigeminal nerve, the fifth cranial nerve, is the nerve responsible for sensation in the face, and control of motor functions such as biting and chewing. Mandibular nerve (V3) 3rd branch - sensory and motor. 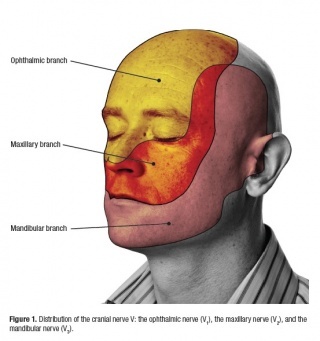 Controlling the muscles of mastication: Temporalis and Masseter. Symptoms of pain is usually caused by compression of the Trigeminal nerve route in 80-90% of cases. Which is located within the Central Nervous System. Common causes of compression can be tumours or their associated blood vessels however in many cases the cause can be unknown. TN can also be a complication of Multiple Sclerosis and other neurological conditions, due to the demyelination of the root entry of the Trigeminal nerve in the pons. Recent estimates suggest the prevalence is approximately 4.5 cases per 100,000 population, with an incidence of approximately 15,000 cases per year. In 90% of patients, the disease begins after age 40 years, most often between 60-70 years. Woman are affected more than men 3:2. 30% experience jolts of pain from the upper lip or canine teeth to the eye and eyebrow, sparing the orbit itself—this distribution falls between the division of the first and second portions of the nerve. According to Patten, fewer than 5% of patients experience ophthalmic branch involvement. The pain quality is severe, paroxysmal, and lancinating. It usually starts with a sensation of electrical shocks, then quickly increases in less than 20 seconds to an excruciating pain felt deep in the face, often contorting the patient's expression. The pain then begins to fade within seconds, only to give way to a burning ache lasting seconds to minutes. During attacks, patients may grimace, wince, or make an aversive head movement, as if trying to escape the pain, thus producing an obvious movement, or tic; hence the term "tic douloureux." The number of attacks may vary from less than 1 per day, to hundreds per day. Outbursts fully abate between attacks, even when they are severe and frequent. A common feature of TN is that the pain is triggered by touching the painful area of the face, as well as activities such as shaving, rubbing, brushing teeth, moving face to talk, cold wind on the face, etc. Studies suggest that trigger zones, or areas of increased sensitivity, are present in one half of patients and often lie near the nose or mouth. No laboratory, electrophysiologic, or radiologic testing is routinely indicated for the diagnosis of trigeminal neuralgia (TN), as patients with characteristic history and normal neurologic examination may be treated without further investigation. The diagnosis of TN is almost entirely based on the patient's history and in most cases no specific laboratory tests are needed. MRI scanning is often indicated simply to exclude other causes of the pain, such as pressure on the trigeminal nerve from Acoustic Neuroma. A range of anti-epileptic drugs have proved to be useful in management of TN, with carbamazepine in particular having a large number of studies demonstrating efficacy. Non anti-epileptic drugs can also be prescribed, often in conjunction with carbamazepine. Studies suggest that approximately 25% of TN patients go on to require surgery as their condition worsens over years, and the drug management becomes less effective. Microvascular decompression and radiofrequency thermorhizotomy are the most common surgical procedures employed in these cases. ↑ 1.0 1.1 1.2 1.3 Love S, Coakham HB. Trigeminal neuralgia: pathology and pathogenesis. Brain. 2001;124(12):2347-60. ↑ Burchiel KJ. Abnormal impulse generation in focally demyelinated trigeminal roots. Journal of neurosurgery. 1980;53(5):674-83. ↑ Katusic S, Williams DB, Beard M, Bergstralh EJ, Kurland LT. Epidemiology and clinical features of idiopathic trigeminal neuralgia and glossopharyngeal neuralgia: similarities and differences, Rochester, Minnesota, 1945-1984. Neuroepidemiology. 1991;10(5-6):276-81. ↑ 4.0 4.1 Manzoni GC, Torelli P. Epidemiology of typical and atypical craniofacial neuralgias. Neurological Sciences. 2005 May 1;26(2):s65-7. ↑ Rushton JG, Olafson RA. Trigeminal neuralgia associated with multiple sclerosis: report of 35 cases. Archives of neurology. 1965;13(4):383-6. ↑ Jensen TS, Rasmussen P, Reske‐Nielsen E. Association of trigeminal neuralgia with multiple sclerosis: clinical and pathological features. Acta Neurologica Scandinavica. 1982;65(3):182-9. ↑ Eller JL, Raslan AM, Burchiel KJ. Trigeminal neuralgia: definition and classification. Neurosurgical focus. 2005 May 1;18(5):1-3. ↑ Patten J. Trigeminal neuralgia. In: Neurological Differential Diagnosis. 2nd ed. London: Springer;1996:373-5. ↑ Cruccu G, Gronseth G, Alksne J, Argoff C, Brainin M, Burchiel K, et al. AAN‐EFNS guidelines on trigeminal neuralgia management. European journal of neurology. 2008;15(10):1013-28.